Here at Kona Coffee and Tea Company it is our goal to not only provide the best available 100% Kona Coffee on the market today, but also to encourage, empower and assist all our neighbors and friends in the Kona Coffee community. We want to grow as a company, but also as a community. Our goal is to be a center for culture, and promotion of Kona coffee heritage as well as to provide a venue for education and events. Hence our love and anticipation for the months of November. October is all about the Ironman Triathlon here in Kona, but November is all about the coffee. 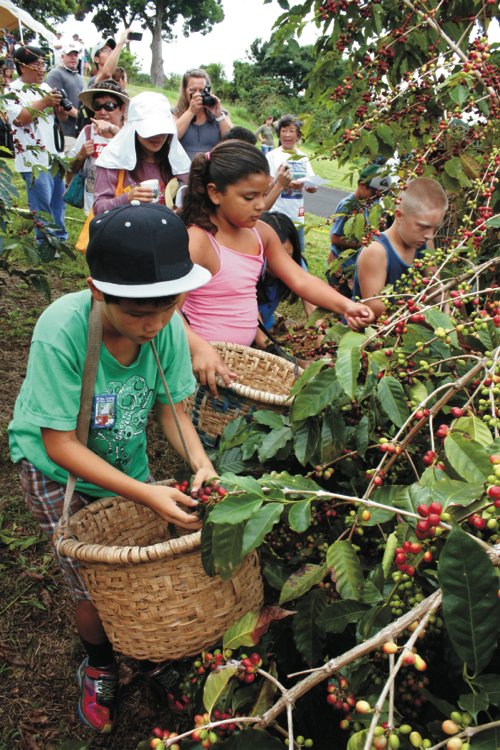 November is the month of the Kona Coffee Cultural Festival. From November 9-18 look for events all over Kona celebrating all things Kona Coffee and Hawaiian Culture. November marks the official beginning of the Coffee Harvest in the Kona Coffee Belt. Up on the high hills of the Kona growing region, the moment of truth has arrived. It’s the time when we literally get to see the fruits of our labor over the last year. Every year we pour our hearts and souls into producing the best Kona has to offer. We are excited to share our new crop with all of you and we are equally excited to share our community and culture. This year, from November 9-18th, the Kona Coffee Cultural Festival celebrates 48 years of bringing farmers, coffee enthusiasts, artists, community and culture together over a delicious cup of 100% Kona Coffee. Consistent with recent trends, this year’s event offers more than ever before, and we are shaking with anticipation (or maybe it’s copious amounts of coffee). We are delighted to see all our old favorites back again. On November 3rd, one of our very favorite events, the Holualoa Village Coffee and Art Stroll is getting everyone excited early. Check out amazing artists, food and culture in the truly unique and historic Holualoa Village. Insider’s tip: This is one of the best opportunities to try dozens of different local 100% Kona coffees. Don’t forget to vote for your favorite. We will be there with hot dark and medium roast from our Single Estate as well as our much beloved and highly touted Kona Cold Brew. We recommend bringing a tasting mug of your own to avoid unnecessary waste. On November 9th at 6:00PM, you best be downtown at the Historic Kailua Village for the Kona Coffee Cultural Festival Lantern Parade. Ali`i Drive is transformed into a sea of glowing lights, music, and beaming faces. This year the parade also celebrated Gannenmono, the 150th anniversary of the arrival of the first group of Japanese immigrants to Hawaii. The 10th of November is all about fitness, beauty and experience. If you are still inspired by the recent Ironman™ triathlon, get up early and head to the Coconut Grove Marketplace for the 100% Pure Kona Coffee Half Marathon. Registration required; $60 through November 9. • Pick coffee with friends and family at the always fun and exciting UCC Kona Coffee Picking and Farm Experience at UCC Hawaii Kona Coffee Estate. They are offering two tours this year - one starting at 10:00AM and one starting at 1:00PM. No reservations required. Insider’s tip: This is a great event for the whole family. Miss Kona Coffee and Miss Aloha Hawaii crowns. Miss Kona Coffee Scholarship Competition begins at 5:30PM at their new location this year; Courtyard by Marriott King Kamehameha’s Kona Beach Hotel. Things keep getting tastier…on November 11th at the KTA Super Stores Kona Coffee Recipe Contest also at a new location this year; Hawaii Community College - Palamanui from 9:00AM -2:00PM. Insider’s tip: This is a tasting event. Samples will be available after the competition. Select vendors will be outside where you can sample and buy coffee, art, and treats. On November 12th The Kona Coffee and Tea Company (that’s us) will be hosting a Kona Coffee Barista Training. Our good friends at Pacific Coffee Research are offering training sessions for baristas, industry professionals and coffee enthusiasts. Training includes espresso technique, latte art and manual brewing methods. Limited to 30 participants. $10 pre-registration required here. Insider’s tip: This is a great event to get in some practice for the Barista Throw Down on November 15 at the same location. The Kona Coffee Cultural Festival Cuppers are available to answer all your questions concerning the Annual Kona Coffee Cultural Festival Cupping Competition up at Pacific Coffee Research November 13th and 14th between 4:00PM & 5:00PM. Also, don’t miss the Finals November 15th 9:00AM-3:00PM at the Maka`eo County Pavilion (Old Airport) Insider’s tip: The results are given at 3:00PM directly after the cupping. Do you like Beer? Wine? Coffee? Food? Come to our Kona Coffee & Tea café location on November 14 for our annual Kona Coffee Beer, Wine and Coffee Pairing. Sweet and savory small plates paired with beer, wine and 100% Kona Coffee. Tickets are $50 and can be purchased by going to our website or by stopping into the café. Then come back again the next day November 15, because we are hosting the Kona Coffee Latte Art ThrowDown from 6:00PM-9:00PM. In collaboration with our friends at Pacific Coffee Research, baristas will compete for a grand prize trip from Alaska Airlines to the Mainland. $5.00 buy-in for competitors, FREE entry to watch with festival button. Insider’s tip: If you have never seen a latte art throwdown, this is a great opportunity to experience the energy and passion and to support your favorite local barista. On November 16 attend the Kona Coffee 101 Seminar at the Maka`eo County Pavilion from 4:00PM-5:00PM and learn all things 100% Kona. Hang out for a bit because 5:30PM-7:30PM the Aloha Makahiki Concert will show off some amazing Hula and Cultural dance. A food truck will be on site. Closing the amazing week of festivities on November 17 is the annual Kona Coffee Cultural Festival Ho’olaule’a at the Maka`eo County Pavilion. Celebrate Kona Coffee and its cultural heritage with Art, Entertainment, Food and more. Insider’s tip: This is the highlight of the Festival for many people. Here, you have all the art, culture, personalities, and great coffee under one roof (and outside on the grass). It is also another opportunity to sample and buy 100% Kona Coffee direct from the purveyors. There is no way we could put all the events and happenings into one post without breaking the internet so here is your last Insider’s tip: Go to the official Kona Coffee Cultural Festival website and check out a full listing of ALL the events and happenings. Make sure you purchase your Festival Button, so you don’t miss out on any of the events and check out the Festival Magazine full of information, maps, coupons, and schedules.